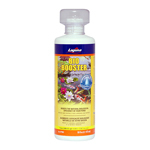 Laguna Bio Booster quickly goes to work as soon as you put it in the water and provides long-lasting results. A biological water treatment, Bio Booster contains millions of beneficial bacteria that boost the natural biological efficiency of ponds as well as reduce and control toxic ammonia and nitrite. Bio Booster also matures filters and filter media, which is critical for the growth of beneficial bacteria. Safe for fish and plants, Bio Booster creates optimum water conditions for the entire pond environment. Use 50 mL per 265 U.S. gal. of pond water (1,000 liters / 220 Imp. gal.). Use the dose cap provided for an accurate measurement. For new ponds filled with tap water, be sure that any chlorine is removed prior to adding the dose. For optimal performance, it is advisable that any UV Sterilizers be turned off for 12 hours after dosage.